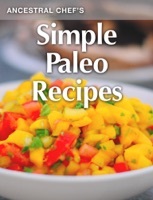 Mouth-Watering yet Incredibly Simple Paleo Recipes. You don't need to spend hours in the kitchen to create delicious and healthy Paleo meals. In this book, you'll find recipes that are quick, easy, and nutritious. Each recipe includes step-by-step instructions that are accompanied by beautiful full-page photos. Just reading the recipes will make you hungry!